Step-by-step education, training, coaching and certification for new agents to get licensed quickly and easily. Innovating coaching and powerful study aids help deliver state-specific and provider-specific info for new agents. The License Coach gives you the knowledge and confidence to pass your state exam the first time. Our insurance and certification courses are fully mobile. Learn on the go, from an internet connected device. Our efficient training system will prepare you for a rewarding future. Get signed up for your insurance certification in just a few minutes. Flash cards, videos, illustrations and diagrams make quick work of learning state guidelines and help you pass your exam the first time you take it. Our courses are designed with compatibility and convenience in mind. All you need is a browser and an internet connection. We all learn a little differently. Our courses allow you to start and stop as needed so you can digest the material on your schedule. Timed exams prepare you for your state test and helps you retain information better. Whichever state you need, The License Coach has you covered. Learn and comprehend information better and faster with our easy study aids. Quick access to definitions and terms without leaving the course page. Get prepared in a variety of ways with audible course option & cram sheets. GET CERITIFIED IN TWO WEEKS. A career in insurance or securities offers plenty of benefits and a flexible work schedule for those who are willing to put their new skills to work. I passed my State Exam! Thank you for providing such a great tool to help learn the insurance business. After having taken the exam, I believe I was more than prepared! The content of your program, the various ways to study and review helped put an enormous amount of information and material in to perspective. Just over two weeks ago,I had next to zero knowledge of the Life and Health Insurance industry, I just wanted to take a final moment to thank you for the program that enabled me to embark on a new career and do so with a solid background of knowledge to help me succeed. Thank you again. I took a couple other online courses before finding License Coach and the difference was like night and day. 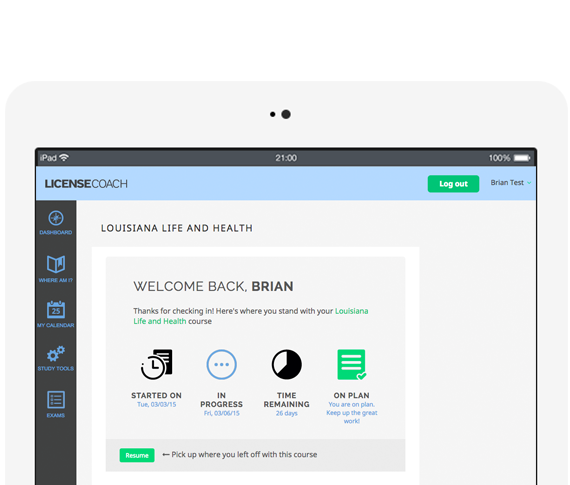 Wow, License Coach makes learning insurance fun and easy, thanks for not just putting a boring book online like your competitors. Coach Jenny is awesome, she keeps it light and bright in her videos and she's an excellent motivator. I passed your practice exam with a 76 and then got a 89 on my state exam. I have already cashed a big commission check and I owe it all to the License Coach! I will recommend your course to everyone that wants to get an insurance agent license and starting a great new career. I have been a recruiter in the Financial Services industry for 10 years. I have tried just about every pre-licensing course in the industry. Our goal is to get our candidates through the licensing process as quickly as possible. By using License Coach, we have significantly reduced our candidate fall-out. This is the best program I have ever worked with and would highly recommend it!